I haven't posted since before the holidays but that doesn't mean that nothing has been going on in the land of RTEMS. I have been trying to work with Roxana Leontie to get her work merged into the Microwindows/Nano-X repository. Roxana was an RTEMS Summer of Code student. The RTEMS Project took the Google donation from the Google Summer of Code and money from OAR Corporation to fund Roxana as the inaugural RTEMS Summer of Code Student. Roxana worked to update and clean up the ancient port of Nano-X to RTEMS. Roxana did all of her work targeting the RTEMS pc386 BSP. 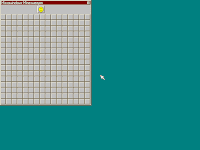 The screenshot in the upper right is the Microwindows minesweeper demo program. As Roxana wrapped up her work, she cooperated with a Google Summer of Student (Xi Yang) who had developed a Gumstix Connex BSP for RTEMS which ran on the Skyeye simulator. Xi implemented a frame buffer device driver for this board which worked with Nano-X. All of Xi's work was merged into the RTEMS Source Code Repository when completed. This means you can decode and display JPEG, TIFF, PNG, GIF, and BMP graphics on an RTEMS system. It also means that you may have support for Adobe Type 1 TrueType fonts. 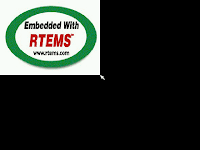 The screen shot with the "Embedded with RTEMS" logo is the output of nxview running on the arm/gumstix BSP. The logo is a jpeg loaded from the RTEMS In-Memory File System (IMFS). The jpeg support library has no patches for RTEMS. Using a build script in the top directory of this kit, you can easily build all of these packages and Nano-X (from their git repository). This includes building all demos for a specific BSP. The RTEMS Graphics Toolkit also includes the following libraries which are not currently ported but we would like to see ported. Roxana is pursuing porting svgalib to bring its collection of more advanced graphics drivers to RTEMS. Interestingly, this ties in with the work of another Google Summer of Code Student, Aanjhan Ranganathan. Aanjhan's project consisted of adding MMU support to RTEMS. This includes support on some targets for the mmap() family of calls from POSIX. The svgalib package includes approximately 100 calls to members of this call family so we now have incentive for Aanjhan to get his work tidied up and merged. FLTK is an important piece of the puzzle because it includes a GUI builder and numerous widgets. This will provide a robust foundation to build GUIs for RTEMS systems. At this point, all Nano-X demo programs that are expected to run on RTEMS do so on both the pc386 and arm/gumstix platforms. There is obviously more to do. But it is important to emphasize that this is a major step forward for RTEMS. It makes it much easier to build GUIs for RTEMS based embedded systems. I think Thomas is extremely busy. So here is my plan, I will quickly have a chat with you as to what the requirement is sometime today when you are online. Then we take it forward. OK? "Hye.. Bless you for taking a few minutes to publish this. I understand where you are coming from on this article however , I do believe that there are more desirable solutions."